I would like to take this opportunity to share my personal journey of working through the Workbook for Students with MiraclesOne. 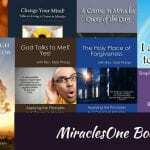 I joined MiraclesOne and chose to make MiraclesOne my “Virtual Spiritual Home” around May of 2012. The first time I went through the Workbook for Students was around the middle of that year as I began practicing the Workbook in around May of that year. 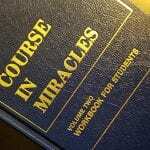 That first year I was totally new to “A Course In Miracles”. The entire Spiritual Practice and Application was something very foreign to me, but I knew that The Holy Spirit had Guided me to this new Spiritual Practice. He completes this beautifully encouraging Introduction to the Workbook with, “Whatever your reactions to the ideas may be, USE THEM. Nothing more than that is required. Now, I, of course, capitalized “USE THEM.” To me, this tells me to remain open, if I found any resistance to any of the lessons to be open to that resistance and to hand it over to The Holy Spirit, and to always keep my heart open to change, healing, and transformation. I freely admit the first year I experienced resistance to many of the Workbook Lessons, I still worked with them as much as I was comfortable. Each year I Read, Practice, and Apply the Workbook Lessons I find there is less and less resistance to the Workbook Lessons that I am resistant to the years before and some Lessons that I might not have been clear to me that year, the following year it usually is more clear and usually speaks to me in a way that I personally need that year. This is a great year to start this journey. It is a personal journey, though you are not on this journey alone. Every member of the Volunteer staff at MiraclesOne feel Called, Guided, and are Extremely excited to assist and be there for you with your Personal Practice of not just The Workbook for Students, but “A Course in Miracles”. If you happen to find yourself at some point missing a few lessons here and there, don’t give up. Pick up and restart. You will not be the first one. I went several lessons where I went without “keeping up,” my first year with the Workbook, and there are still years this happens, as life happens, but the team at MiraclesOne were Always there for me for whatever I needed and that’s our commitment to you. We are Always here for you. We provide several outlets and have planned our entire year to study the Workbook Lessons in various formats throughout the year. I find by joining with others with like minds who are going through the Workbook for Students as well, and as we join and all walk together on this journey. I find by this that when I join in one of our groups, not only gives me the encouragement I need, but refreshes me just in the sharing and I always leave the meetings refueled. The on Tuesday evening study group, as is the Wednesday afternoon study group are “Drop-In” study groups, meaning “Drop-In” when you are able to be there. There is no commitment to attend weekly. We are simply Always here for you.